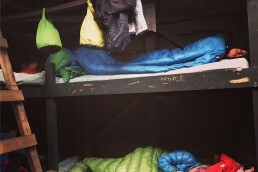 I slept well despite the rain on the roof overnight. We thought we heard some mice in the hut just before we all went to sleep, and Wallace (this was his first night on the trail) had left his food scattered about all over the table. My thought was – well if the mice come in the night they will eat his food not mine. But in the morning all seemed to be fine. Outside there were patches of blue sky and it looked as though there could have been a fresh dusting of snow overnight on the mountain tops. It was difficult to tell because we hadn’t been able to see anything yesterday to compare it with. I packed up and left just after 8 and went straight into the climb. It was so cold in the hut I started out with my puffy vest and waterproof coat on, fully expecting to be too hot within the first 5 minutes, but as I climbed the colder it got. The clouds rolled in and visibility was poor. The forest was so dark at one point I struggled to see. As I came out above the tree line and into the tussock it started to snow just a tiny bit, and I was starting to think my plan of waiting out the weather in Bealey hut had been a mistake! Thankfully the snow didn’t really come to much and the drizzle was much easier to deal with than yesterday’s pouring rain. Around 10am the weather started to clear up a bit and I could start seeing mountains around me, and snow capped peaks in the distance. No one had caught me up yet and considering the first hour and a half was a climb I was surprised but pleased. I’m feeling really good today, a lot lighter than I have done in weeks, I only have myself to think about, I don’t feel like I’m in a race, and maybe more things were getting under my skin than I realised. But still, the trail was about more than just doing big miles every day and I would have happily gone on to the end as a partnership. I stopped a few times to change my layers, my coat was on and off all morning. I reached the A-frame hut and Hugo caught me up. After a bit more forest walking we walked down the river bed and crossed the river a few times and managed to keep dry feet by hopping from rock to rock. The trail turned away from the river for a bit and went through the forest again up to West Harper hut. Built in 1957 it’s a basic hut with a dirt floor and canvas bunks, and although it was interesting to look at I’m glad we didn’t have to stay there! Colin and Sandy caught me up as I was looking around and we decided to carry on to Hamilton hut to have lunch there. On the way I saw Hugo walking through the river and he hadn’t taken the trail, instead choosing to follow the river, and he had fallen over and cut his chin which had blood dripping off it. I checked he was ok as he seemed a bit spaced out but he assured me he was fine and carried on. He is tall with a long stride and much faster than me. I made it to Hamilton hut at the same time as Sandy and Colin and Sian and Colin were there looking all confused to see us. They thought we were ahead of them as they hadn’t stopped at Bealey hut to see we were all in there. The famous Hamilton Hilton was a nice hut, but as I thought it was still just a hut. The fire was nice though. After a quick lunch of an unappealing tuna wrap, and openly staring at Sian’s food (they are carrying a jar of butter and a jar of pesto and other nice things, and they are eating spoonfuls of coconut oil – gross! ), we carried on so we would make it to the last camping spot before Lake Coleridge. The trail follows a 4wd track and it crosses the river numerous times so it was feet wet time, well they were already wet from the grass this morning but now they would be wet and squelchy. At least the streams were low and easy to cross and not as cold as expected. The scenery got better and better all afternoon and the weather cleared up and we had blue skies and sunshine! The landscape turned into real Lord of the Rings stuff and you could imagine them riding through here on their horses. I had a couple of hours to myself and I felt great, and it gave me a chance to reflect on the real reason I’m doing this hike – to raise money for Just A Drop, remember Alex, whatever problems you have they are nothing compared to the problems people who don’t have access to clean water to drink are having. The trail becomes a bit hard to follow as the track disappears and you walk in the river bed, crossing it several times. I checked the GPS which was a mistake because the app seems to be a bit off in these types of sections. It has been pretty much spot on until now and it said I was off trail so I made my way back over to the red line and bashed my way through some bush for a while until I decided it was ridiculous and turned back on myself to get back to the river. I spotted Sandy and Colin and they seemed to have found some orange markers to follow so I stuck with them for the rest of the afternoon. We spent a lot of time wading through water but the track eventually turned into a gravel road and then into a dirt road where we could really pick up some speed and cruise along not tripping over anything! Sandy said she had the same rash on her legs as I had the other day, and as I thought about it I felt something sore on the backs of my legs. I wish I knew what caused it, then I could more actively avoid it! Hugo came up behind us as we came to the end of the road, I’m not sure where he had been but he seems to like to take a few side explorations on the way, although I’m not sure they are always intentional! We all walked together for the last half a mile to the campsite which is just a short distance off the trail. Hugo mocked my short stride and we both agreed we would be more exhausted than we already are if we had to walk like each other. The campsite was basic but it had a toilet, water and flat ground which is all you really need. The picnic table was already occupied by the 5 other people already there but we don’t know any of them. Hugo was chatting away to me in French, completely unaware that he wasn’t speaking English to me so I didn’t understand what he was saying. We got there around 6:30pm and pitched our tents, the sun was still strong and it was nice and warm inside, but as soon as the sun went down so did the temperature. I wet wiped my sore bits on my legs and applied some cream, so hopefully they won’t keep me awake tonight, they don’t look anywhere near as bad as they were before so that’s good.